Thanks to the dozen of service review sites, we now can have a decent portrait of any type of company we want to do business with. That holds true for plumbers, exterminators, electricians and junk haulers. In the latter category, Junk King is winning rave reviews from the vast majority of its customers. Those “10 out of 10″ ratings are a wonderful vote of confidence that dominates the Junk King reviews. That is what you should be looking for in a professional junk hauling company. When you get right down to it, the junk hauling job shouldn’t be all that complicated or time consuming. You want a company that can provide quick access to its work crews. When you call into Junk King, you’ll be put directly in touch with the crews. This will come in handy if they happen to be in your neighborhood and can perform a same-day junk pickup call. Those lines of communications stay open with the crews informing you when they are 20 minutes away from arriving. You also shouldn’t be kept waiting for a junk removal appointment. Junk King will provide you with a two-hour window that is often not even needed! The reviews reveal how friendly the Junk King crews are. If you’re inviting a worker into your home you want to be treated with respect and a smile. The Junk King crews are happy to lift and load any object from any spot on your property. They’ll even sweep up when they are done the loading. The perfect junk removal company is also someone who takes responsibility for what they are collecting. It is easy to load up a truck and then dump the junk at a landfill. However, that’s not always good for the environment. Junk King is dedicated to a vibrant recycling policy. That includes dropping items off at recycling centers and charity. Any excuse to avoid the landfill is perfectly fine for Junk King. Your junk removal company should also offer fair and transparent pricing policies. Junk King will tell you the exact fee you’ll be expected to pay before the job gets started. That will be an extremely affordable rate base on the volume of your junk. It’s also a rate that is not going to change once everything is loaded. If you want professional and reliable junk removal service, then Junk King is the only call to make. 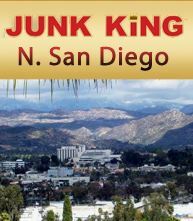 This entry was posted in San Diego Junk Removal Company and tagged Junk King, Junk Removal Company on July 31, 2014 by John Bonavita. Last updated August 1, 2017 .